Yesterday there was a letter through the door from the police, announcing that they were doing a local crime prevention initiative and coming around with Smartwater kits for the locals. Unfortunately the blank bit of the letter for the date hadn't been filled in, so I had no idea when they were going to do this. Two nice officers showed up this morning - which hadn't been much warning even if the date had been on the letter, but never mind. I wasn't busy. They both said hello to the cats and the WPC was particularly taken with Iella. Diesel sat on the table and watched with interest as the PC talked about Smartwater and demonstrated it. Smartwater is a liquid which can be given a unique chemical code. It's dabbed onto property, giving items a chemical DNA unique to the registered household. It shows up under UV, so secondhand shops can check for it, and the police check for it on items at car boot sales and the like. Apparently the Shoreham street area had the highest burglery rate in Sheffield, but after a campagain of Smartwater marker, the rate has dropped by 95%. So I took my free bottle and marked up various things including jewellry. And figured while I was doing that, I should take some decent clear photos of the good stuff. 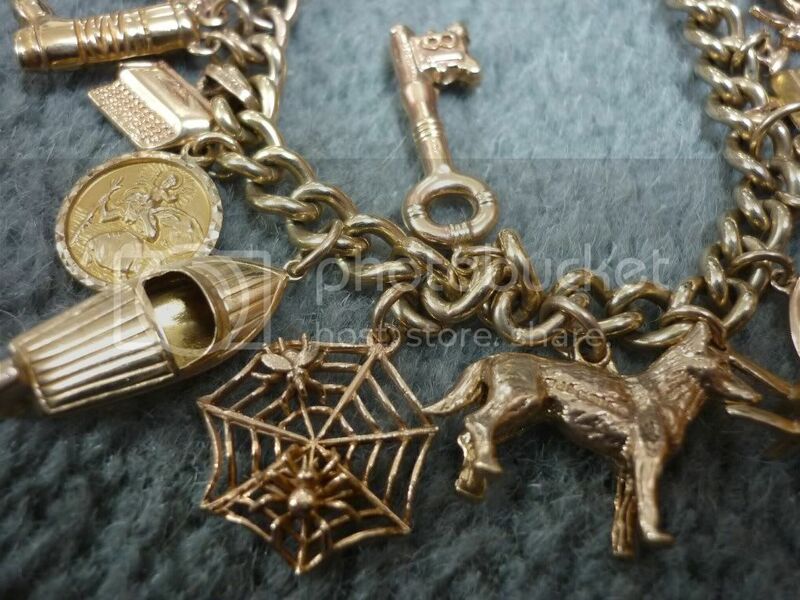 This included the gold charm bracelet given to me by my godmother, Pat. 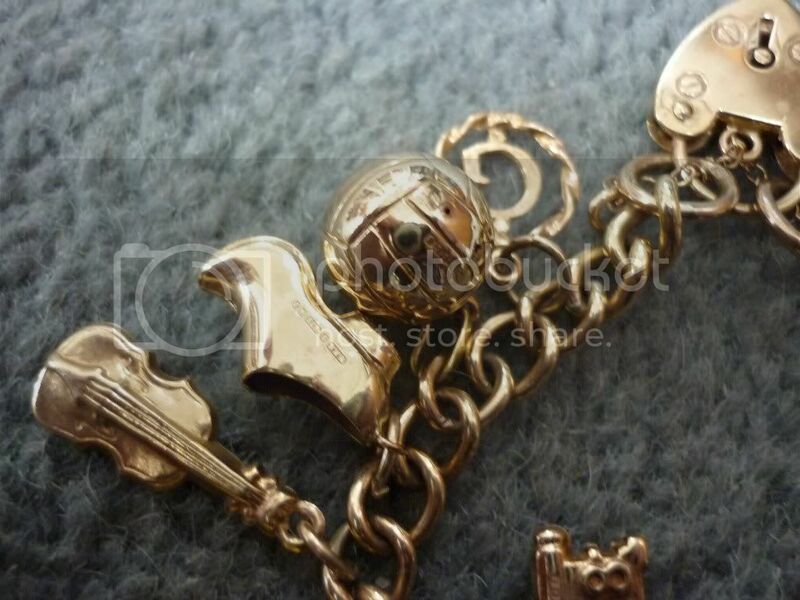 My Mum and Dad bought the chain, but every year until I was 21, Pat gave me another gold charm for it. The older ones especially are very nice, heavier and beautifully made. 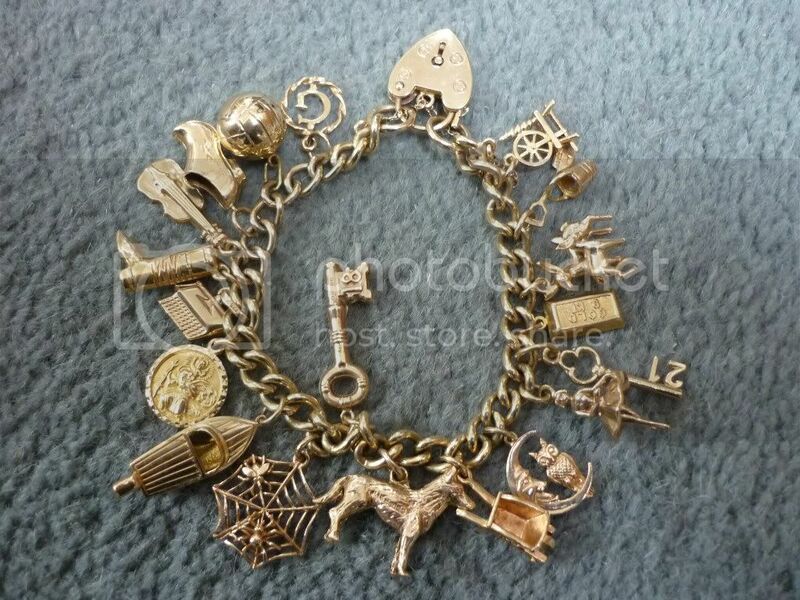 Pat said I could sell the bracelet any time, if I needed the money for something, but I can't bring myself to do so. Pat died Xmas 2008 and left me a small legacy in her will. 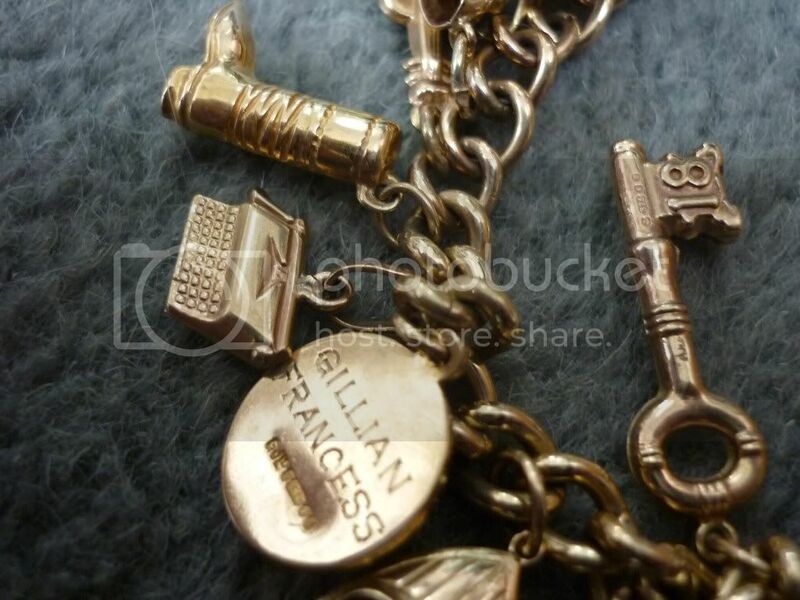 I have other things she gave me, but the bracelet is special. 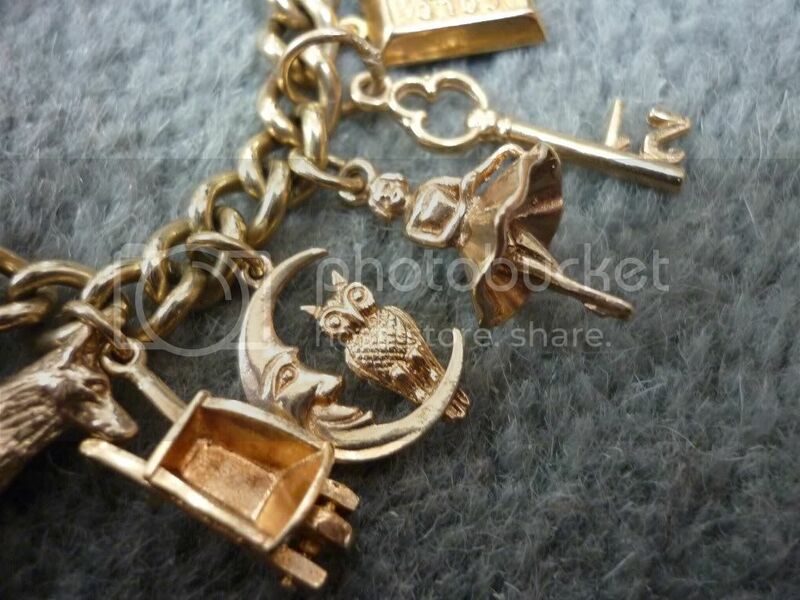 there are some really beautiful charms on there! I think the web with spider and fly is my favourite, though the ballet dancer, spinning wheel, wheelbarrow and speedboat are lovely too. Not sure what Pat was thinking of when she chose the football, mind you. That really is a treasure, and it's lovely to have something like that to remember her. 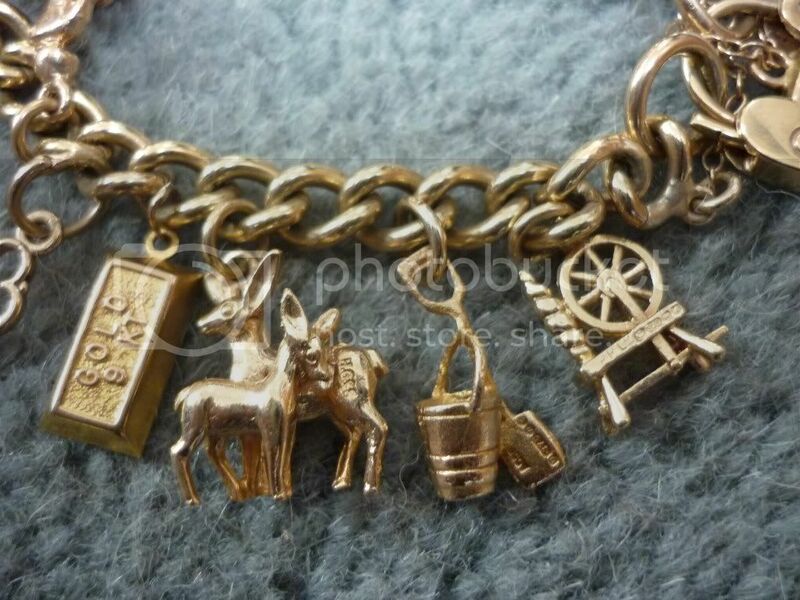 I wished I can make charms like that! It is great you got the Smartwater! I think they are really expensive to buy! I wonder if you can get a window sticker that says "Smartwater" to deter burglars too? You know, I have a flashback that I got one of those letters or leaflets too last year during baby haze... ah well!